In this essay I am concerned with the foregrounding of subjective points of view and the dialogic encounter with audiences as they are related to the motion picture Waltz with Bashir, made by Ari Folman, and my own student film that’s in production, Sound Holds the Distance Travelled. My interest in exploring the dialogic encounter with audiences stems from the fact that the film Waltz with Bashir also exists in a separate creative form as a comic book. My own short film is an adaptation of a short sequential art story from an original comic script written by Sadhbh Lawlor and illustrated by myself. This original story is part of a wider collection of stories entitled The Melancholic Wife and her Perpetrating Husband. This series has set out to explore the limiting effects of simplistic, objective labels on complex individuals. I would like to investigate what potential there is for new conversations to be created by taking this story into a new form. Whether the essay form maintains, as Mikhail Bakhtin suggests, an “ability to carry on a continual dialogue with other works of literature and other authors. It does not merely answer, correct, silence or extend a previous work, but informs and is continually informed by the previous work” (Bakhtin, 1981). For example, one of the conscious choices in the original comic was the decision not to show the reader the protagonists face, her head is seen from the side or from behind or obscured in some way. This choice was a risk, endangering the characters relatability and; would it be noticed, would it be engaged with? It represents an attempt to engage with any subjectivity on the part of the reader, they experience the character through the writing, through their interactions with the world around them and the depiction of that world. The first impression of the character resides in a space in between subjectivity and objectivity because the information the reader is receiving is limited. Therefore their idea of the character has a different potential to the typical to evolve over time. This will colour the perception of the short film as the protagonist’s face will be shown for the first time in this medium. This is a choice made for creative reasons informed by; a new audience encountering the protagonist; the practicality of limited production time and resources; but nevertheless has the potential to open up new directions for creative discussion and learning. To help facilitate these elements of the essay format both Waltz with Bashir and my own film employ voice over narration in some form. In my own film it is the only dialogue, offering a tension between the audible story and the visual story, a dialogical ‘double-voicedness’ (Montero, 2012) within the piece. This dialogical voice can be considered integral to the essay format, Timothy Corrigan describing essayistic thinking as being “modelled on the question – answer format initiated as a kind of Socratic dialogue” (Corrigan, 2011) and the essay as “an encounter between the self and the public domain that measures the limits and possibilities of each as a conceptual activity” (Corrigan, 2011). Waltz with Bashir can be described as utilising the mode of an editorial essay. It is concerned with actual historical events through the investigation by an Israeli veteran of experiences during the First Lebanon War of 1982. Rather than reportage or documentation of facts though, the film seeks to editorialise as a subjective agent of the information, having an intention to step in to think about and explore the events through different bodies. This is literally manifest in the film as it is built around recorded interviews with nine friends and it is also present because of examining the experiences from a conscious and unconscious; personal and social; active and passive sets of viewpoints. The film opens with an anxiety dream of Boaz, one of the nine friends. In it he dreams of rabid dogs rushing through an urban environment terrorising the inhabitants as he, the dreamer, watches from a high window above the street. He notes that there always 26 dogs, this is the exact same number of dogs which he shot dead while stationed in the Lebanon. It is intimated that this dream is related to the wider Lebanon War experiences of the group and contains an underlying question about what occurred during their time there. Boaz asks for Ari’s help as a filmmaker specifically, because “films can be therapeutic” he says, which sets Ari on the road of self discovery that the film charts. Catalysed through an engagement with a dream, Waltz with Bashir becomes an investigation by an individual “adrift in a historical trauma which has fragmented him both personally and socially, struggling with a repressed subjectivity that vibrates through a social network of former comrades” (Corrigan, 2011). Time and again within the film we see the use of metaphors to attempt to convey the soup of memory in which the protagonist finds himself, a “subjective drift” (Corrigan, 2011). Early in the film Ari flees into the ocean away from an attack, in which he then drifts without direction, attempting to find a safe place to land. He is shown an old picture of himself by a former comrade but he doesn’t recognise himself. In one scene he climbs from a boat that’s lying just offshore and floats in the ocean cradled in the navel of a woman three times his own size. There feels like a passive urge to forget which is counteracted by an active engagement to remember, “Tell me Frankel, was I there too?” he asks one of his friends, and Frankel reminds him, “Sure,…… you were everywhere with me.” Ari begins to realise that through this investigation that “maybe I’ll discover things about myself I didn’t really want to know”. Throughout the film we return to water in some form, the soup of memory that is an enticing lure to surrender to. But we discover that we need to engage in active confrontation with the assumed passivity of dream and memory, it is not an objective, neutral resource to be relied upon without due diligence. As described within the film by the therapist Zahava Solomon, “Our minds don’t take us to the places that we really don’t want to go. They have a way of preventing us from going into dark and totally dangerous recollections. Our memories will take us only as far as we’re capable of going.” This confrontation opens up and drives the narrative of the film and it is further interesting that it is facilitated by another voice, a dialogic encounter within the film. 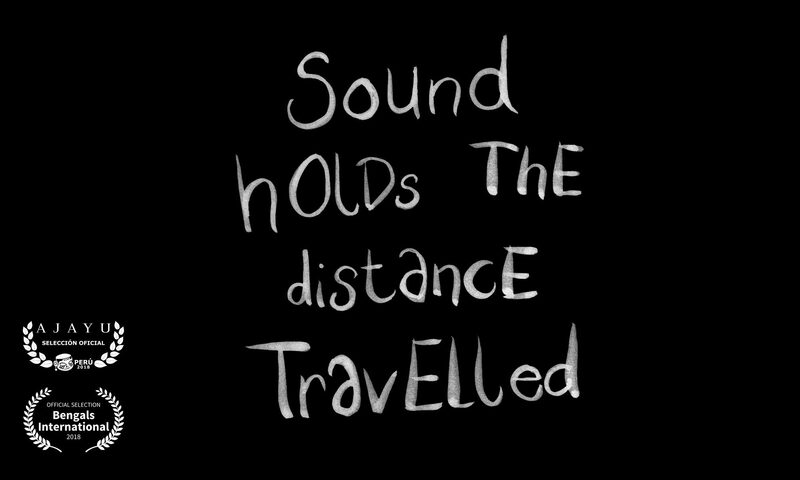 In my own short film Sound Holds the Distance Travelled I am also trying to illustrate the interplay of dream, memory and critical personal investigation. The catalyst for my protagonists journey is the intrusion of subconscious memory into her meditative space. This meditative space is accessed through an act of dancing, not waltzing in this instance, but a personal, self expressive method of being responsible to her own melancholy. Melancholy here describes a knowledge of the harder aspects of life while continuing to attempt to live a brilliant, mundane existence. The emergent memory triggers the entry into a dream space, a metaphorical landscape for her process of dealing with the shame and embarrassment feelings which the remembrance provokes. This essay film “tracks a person’s thoughts as … (she) tries to work out some mental knot, however various its strands” (Loparte, 1992). In contrast to Waltz with Bashir, where the process and subjective memories occur and manifest from within a foreign landscape, the dream scape in my film is an interpretation of the protagonist’s childhood home. The sea in Waltz with Bashir may be acting as a relatable point from which Ari is able to access uncomfortable memories, a touchstone to maintain a sense of security by periodically entering it’s embrace. Ari and his friends are invaders into this land called Lebanon wherein lies their trauma. My protagonist is at home with her trauma, in a place in which she has developed and knows intimately. So she has power to evade her demons at points in the narrative thanks to an ownership of the space. But the demons also know the space intimately so they are able to manifest against her through the subtlety of sound waves and shadow, elements which relate closely to the environment in which they exist. This creates a non verbal dialogue between the protagonist and her trauma, and a contest over who will own this subjective space. The locale is also a finite one, the protagonist here does not have a sea to retreat to, so her journey necessarily takes on the aspect of a chase. This chase manifests in three strands of a “mental knot” (Loparte, 1992). The first strand is of memory of the physical act which heralds the arrival of embarrassment; the pulling up of soft, sound suppressing carpets in her childhood home to reveal bare wooden floorboards underneath. These are sanded and varnished, a positive act of self care in worldly terms but taken from our protagonists subjective view, it is also an act which triggers an invasion into a solitary (by necessity) act of meditation. If we were to try and take this action and express it in purely positivist terms of measured cause and consequence to attain an objective viewpoint we may quickly lose understanding and reduce the action to a matter of right or wrong. This could neglect the nuance of positive and negative experiences within which an understanding of complexity might be attained. In the visualisation of this strand sound waves become physically manifest to harass and compress the protagonist, the narrator talks of sound now travelling easier to the rooms below. This exists as a scientific objective fact, sound travels easier through wood than a layering of wood and carpet. But it is the subjective human experience that illuminates the visuals capable of being employed within the film giving a “new order to such things as once lived” (Lukacs, 1974). And how much more affecting the essay can be as an art form, the attempt to communicate, with this subjectivity, “science affects us by its contents, art by its forms; science offers us facts and relationships between facts, but art offers us souls and destinies” (Lukacs, 1974). The second strand involves the protagonist’s attempt to embrace the memory of her past self. At this point I’d like to explore the importance of the relationship between narration and visuals in the creation of essay films. This will necessarily also touch on the dialogic aspect of the essay film, creating open questions between the protagonist and her memories; between the sound and visuals; and between the film and its audience. Narration and its ability to communicate in a space separate from attendant visuals has been considered one of the particular strengths of the essay film genre; “one of the key elements of the essay film is the direct address of the receiver, and voice-over is the most simple and successful way of actualizing such address” (Rascaroli, 2008). She tried to be kind to herself when she thought about the teenager she had been. But some tasks are so large that the effort required to complete them is too overwhelming to comprehend, never mind to endeavour upon. It is hoped that this description communicates from a relate-able distance the internal processing that occurs for the character. While holding awareness of the power of using voice-over and the opinion that it “has often been accused within documentary theory of producing an authoritarian discourse and superimposing a reading on the pure truthfulness of images” (Rascaroli, 2008). The narration is not heavily laden with descriptors of the internal process, rather it tries to leave a gap in which the visuals may enter, providing their own interpretation. In this case for the visuals I’ve chosen from my subjective viewpoint to use ghost imagery for her thoughts about the teenager she had been and dark, shadowy, clawing hands dragging the character down into a widening pool of black to represent the task so large. This is part of my “expression of a personal, critical reflection on a problem or set of problems” (Rascaroli, 2008). Attempting to be conscious of authoritarianism through the visual indicators as well as the voice-over, the intention is to leave that afore-mentioned space left by the narration and not to try and close the gap, “The author’s personal reflection asks to be either shared or rejected by the viewer” (Rascaroli, 2008). The third and final strand of the film involves the protagonist taking the learning from her previous encounters with her melancholy and reconnecting with the power of her self-expression through dance which was her intention at the start of the narrative. In this sequence lies probably the greatest personal creative subjectivity in the film as the imagery and voice-over more closely align. She re-emerges back into the unromantic walls of her real life, striving to hold on to the nuances of her transmutations. The fact that the character of the Melancholic Wife also exists outside of this film interpretation in other creative media can come into play in this regard. Her story lives in other settings and follows other narratives, offering a viewer the choice to explore the nuances of her story if they so desire it. As I am adapting my film from an existing short story which is part of a greater narrative, and Waltz with Bashir also exists as a separate piece of work in the form of a graphic novel, I am interested in the dialogic aspect of the essay film. It’s “ability to carry on a continual dialogue with other works of literature and other authors. It does not merely answer, correct, silence or extend a previous work, but informs and is continually informed by the previous work”, (Bakhtin, 1981). It is this approach to the creation of essay films which enables it to resist some of the finite boundaries connected with conventional film narratives and avoid being placed into established genre labels like documentary. But it is also this element of the essay as an art form which contributes to it being “decried as a hybrid” (Adorno, 1984). Placing toes in both the ocean of autobiographical documentary and the sea of imaginative interpretation while trying to maintain an existence in the space in-between. “Elusiveness and inclusiveness seem to become the only characterising features of the essayistic” (Rascaroli, 2008). Waltz with Bashir facilitates an ongoing conversation, not just through examining real life events that by their very nature necessitate examination, but by also exploring these events through a subjective lens. This subjectivity opens an exchange between the lived experiences of these particular participants in the events that occurred with the official recorded events and with the experiences of others at the time, most notably the victims of the atrocity which lies at the heart of the investigation. Corrigan discusses the “problematic” (Corrigan, 2011) of the challenge in creating this dialogue responsibly, the danger of the violence in the Middle East becoming “reformulated as a narrative of victimisation” (Corrigan, 2011) on the part of the aggressors in this situation. He argues that Waltz with Bashir manages to avoid this because the film “confronts it as an effort to claim a personal responsibility through the struggle of memory to admit accountability, that is, as an essayistic restructuring of a public trauma as a personal responsibility” (Corrigan, 2011). It is here that the film must try to adhere to the structure of the essay film, “that of a constant interpellation; each spectator, as an individual and not as a member of an anonymous, collective audience, is called upon to engage in a dialogical relationship with the enunciator, to become active, intellectually and emotionally, and interact with the text” (Rascaroli, 2008). Being aware of the intention to create further dialogue, the film attempts to maintain ownership of its subjectivity, and not claim an authorial position over the lived experiences of others affected by the events. In this way these strands of the essay film genre intertwine, subjectivity creating dialogue. The use of animation as the mode of communication can strengthen the conscious, responsible subjectivity needed due to the effort required to practically and imaginatively engineer the world in which the narrative is going to take place. The film was produced using three different types of drawn animation, enabling it to “create a flexible and shifting media surface of changing subjectivities” (Corrigan, 2011). The particular choices of timing and movement of the bodies and objects of the film enable a creative control which facilitate “these images (to) overlay and reanimate documentary reality as more visible disjunctions and disruptions that represent the disassociations that occur between the investigating subject, the subject’s memory, and a resistant traumatic reality” (Corrigan, 2011). For my own short film, a challenge arises in representing what the viewer might characterise as mental health issues in a responsible manner, both to the broader issue as it exists in wider society and also as an expression of personal experience and encounter with the audience. “The spectatorial position is in the singular, because the genuine essay film asks questions and does not offer clear-cut answers” (Rascaroli, 2008). The challenge put to the creator is what questions to consciously ask the audience of the film and what answers to avoid providing. Engaging fully in the subjective voice represents a challenge because, no matter the intention, if a creator does not manage to communicate that intention through the interplay of visuals, timing, voice over and sound, then they will be communicating a different message. A message that the creator will still need to own for themselves and that will be engaging with a public outside of their control to contextualise or further editorialise the creative work. “The author’s personal reflection asks to be either shared or rejected by the viewer” (Rascaroli, 2008). The choice to create an essay film then is not one to be taken lightly. I am supported in the creation of a responsible personal reflection through having already engaged with aspects of the work and issues raised within it in the comic work. The foundation of the protagonist and an interpretation of her story existing in this other space is supportive in the challenge of public representation by facilitating further interaction if the viewer so wishes it. Bearing in mind the subjective and dialogical aspects of essay films discussed here, the potential of animation as a medium to be explored within the genre seems great. In terms of the subjective voice, the practical reality that every visual element of a purely animated film must be created, from location and character design through to movement and timing, offers a film maker the opportunity to communicate their personal perspective on many levels. The choice to risk the expression of the personal must also be respected and made conscious by the film-maker. It represents a responsibility to the act of communication, their views must live in the world independent of them, with an audience free to interpret, question and categorise what the film maker is trying to say. To return to the quote at the beginning of this essay, it could be argued that the “something already formed” that the essay film strives to communicate the truth of is the creator of the essay themselves. The essay film-maker is asked to speak the truth of their own experiences with the intention that “the living truth of events has surfaced through the subjective choices and inquiries of the essayist” (Corrigan, 2011). Adorno, T.W. (Spring – Summer, 1984), The Essay as Form, New German Critique, No. 32, pp 151-171. Alter N.M. And Corrigan T, (2017), Essays on the Essay Film, New York, Columbia University Press. Bakhtin M.M. (1981) Holquist M. (ed.) Emerson C. and Holquist M. (trans. ), The Dialogic Imagination, Austin, University of Texas Press. Ekinci B.T. (2017), A Hybrid Documentary Genre: Animated Documentary and the analysis of Waltz with Bashir, Cinej Cinema Journal, Volume 6.1, pp 5 – 24. Freud S. (1957), Mourning and Melancholia, Strachey J. (ed.) Strachey J., Freud A., Strachey A. And Tyson A. (trans), The Standard Edition of the Complete Psychological Works of Sigmund Freud. Volume XIV, 1914-1916, On the History of the Psycho-analytic Movement, Papers on Metapsychology and Other Works, London, The Hogarth Press, pp. 243-258. Husbands L. (2014), Rolling Amnesia and the Omnivorous Now: Jeff Scher’s You Won’t Remember This Trilogy (2007-2011), Alphaville: Journal of Film and Screen Media, Issue 8, Winter 2014, Web. ISSN: 2009-4078. Loparte P. (1992), In Search of the Centaur: The Essay Film, The Threepenny Review, No. 48, pp. 19 – 22. Lukacs G. (1974) Bostock A. (trans. ), Soul and Form, Cambridge, MIT. Rascaroli L. (2017), How the Essay Film Thinks, Oxford, Oxford University Press. Rascaroli L. (2008), The Essay Film: Problems, Definitions, Textual Commitments, Frameworks, 49(2), pp. 24 – 47. Waltz with Bashir (2008) Directed by A. Folman [DVD]. Los Angeles: Sony Pictures Classics. Lawlor S. And Gowran G. (2015) The Melancholic Wife and her Perpetrating Husband Episode 5, Splitting Borders [online]. [Accessed 3 January 2018]. Available at <https://splittingborders.blogspot.com>.